I get irritated when I see a quilt in a film and realize that the style, age, pattern etc. is out of sinc with the time period. 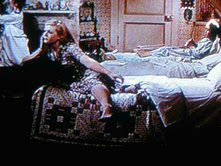 Example: in Coal Miner's Daughter, Loretta Lynn's parents snuggle under a polyester doubleknit quilt--sheesh! 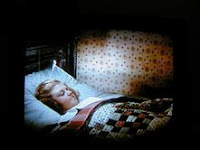 Or in the TV movie Sarah, Plain and Tall, the quilt on the bed is a classic 1930s pastel Double Wedding Ring but the story takes place in 1913. For me, that sort of ignorance means that the set/interior design consultants in Hollywood can't tell their quilts from a hole in the ground. Wouldn't antique car buffs rise in anger and disbelief if a Model T went whizzing by in the background of a western? Bet your bippy. On the other hand, last week on the Turner movie channel, National Velvet played and lo and behold, there was a quilt featured on the bed of the eldest Brown daughter Edweena, played by an incredibly young Angela Lansbury. A sort of pink and brown Irish Chain variation, c.1880s, and actually right for the movie's time period and place (England). I asked about the quilt on a chat line for antique quilt lovers and Barbara Burnham watched the movie and sent these pictures. Thank you Barbara. Now with the internet and people weighing in on everything, these visual bloopers can be pointed out and hopefully avoided in the future. However, there is an employment possibility here...and I am ready and willing to step into the breach. I declare here and now that I am available for consulting work as a 'quilt wrangler' on any film productions. Hollywood, I'm waiting.